Cold cauliflower soup is a refreshing first course during the hot weather, especially with the heatwave that we've been experiencing these past few days. I blended cauliflower, sweet round rice, ginger garlic paste and crème fraîche with a few spices such as cumin, coriander and turmeric. 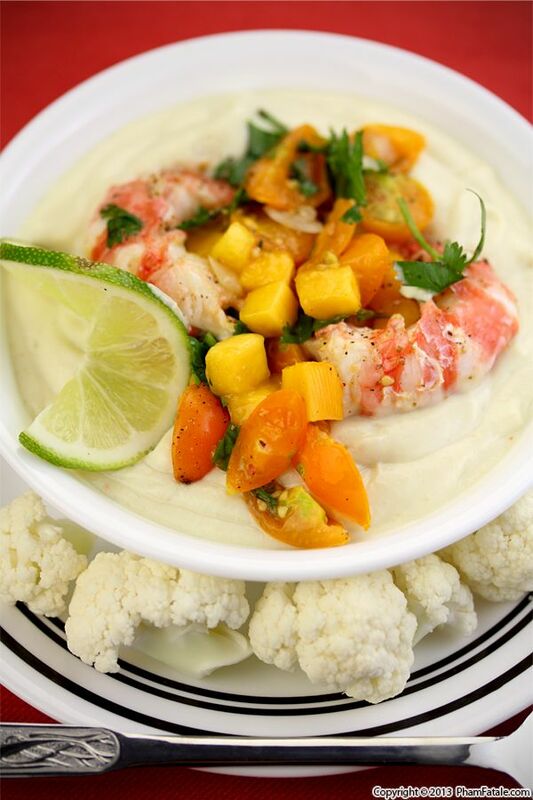 I served it in bowls (you could also use chilled glasses) topped with grilled shrimp covered with mango and sungold cherry tomatoes. My husband Lulu is a vegetarian so I simply omitted the shrimp and prepared a separate batch using flavorful homemade vegetable stock. That way Lulu and I were able to share the meal together. Canh bí đỏ is Vietnamese pumpkin soup. But in this recipe instead of simply boiling the pumpkin in broth, I used it as the filling in wonton wrappers (hoành thánh in Vietnamese). The Vietnamese pumpkin has a naturally sweet creaminess. If it's cooked properly the skin is also edible and adds a wonderful texture. To make the dish into a complete meal, I add fried tofu for protein and wheat germ, fried onion and shiitake mushroom for extra flavor. 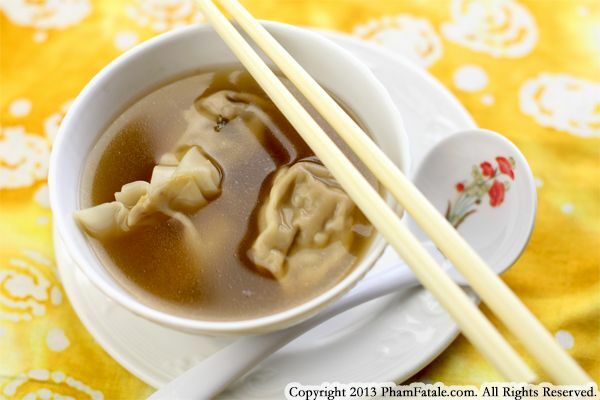 The rest is a simple broth so as not to overpower the flavorful pumpkin wontons. This is probably the last soup I'm making this season as we're slowly experiencing warmer temperatures. I prepared the soup with 10 varieties of beans. Four-pound mixed bean packages are readily available at my local Korean market. 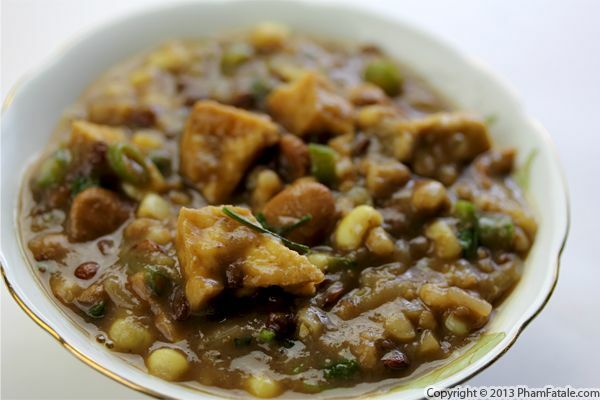 In this particular one, only seven dried beans were mixed in it, namely soybeans, chickpeas, kidney beans, black beans, peas, black eyed peas and lima beans. I also added white cannellini beans, green beans and edamame beans to complete the nourishing soup. In addition to the soup, I included corn kernels for extra sweetness and deep-fried tofu cubes for texture. Everyone in my home enjoyed it because the starchy vegetables are quite filling and almost make you forget about meat! 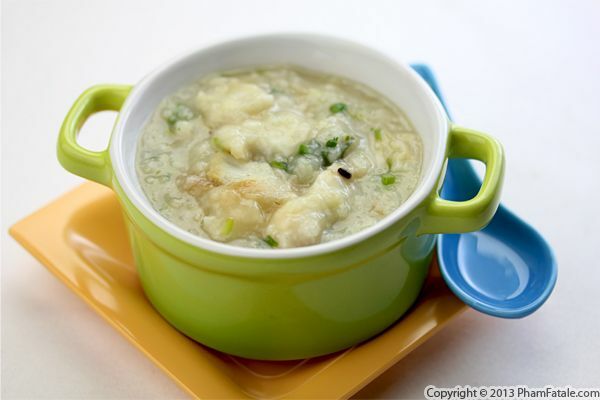 The authentic recipe for lotus soup, called canh củ sen in Vietnamese, calls for pork broth, dried scallops, dried octopus and various dried fruits and nuts. With my family being mostly vegetarian, I adapted it to fit everyone's diet. I tried to mimic the meaty broth with Okinawan potatoes (purple-fleshed Japanese sweet potatoes) and preserved daikon radish and flavored it with the usual dried black dates called jujube (or plum), dried South almonds, peanuts and gojee berries. 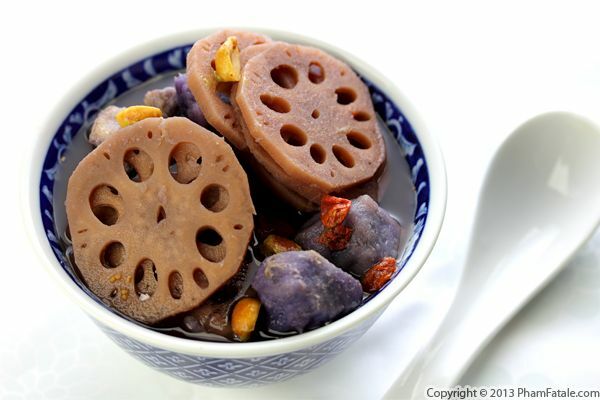 Lastly, fresh lotus root is sliced thinly and added to the broth until softened. Some people like it on the crunchy side, but I prefer it very tender. Page 14 of 18 pages.